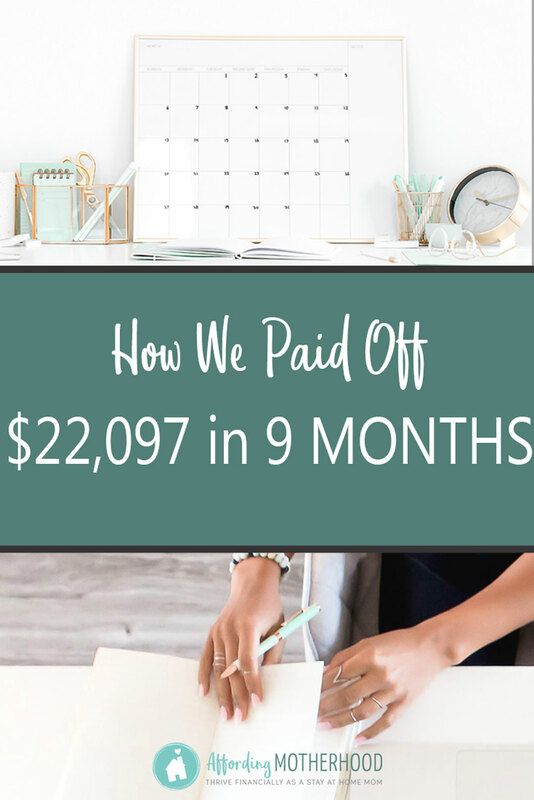 How We Paid Off $22,000 in 9 months - We Are Debt Free! by Shannon Clark in Pay Off Debt, Top 10 | 74 comments | Contains affiliate links. We are debt free! 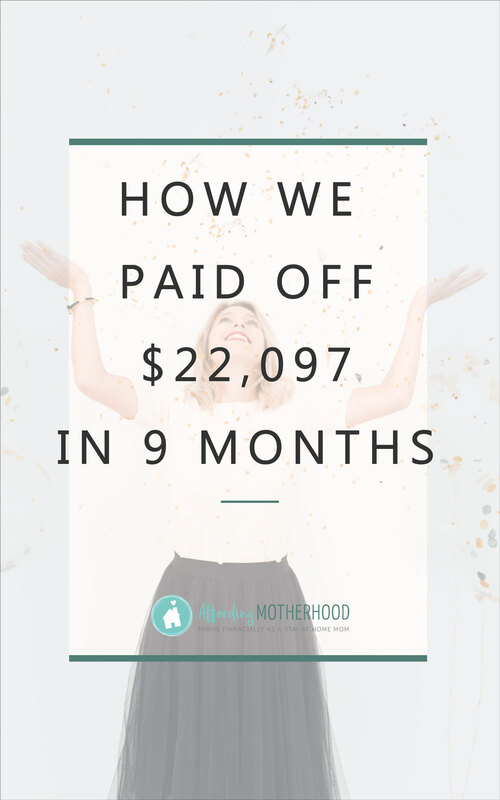 I can’t wait to share how we paid off over $20,000 in debt in less than 9 months. But that phrase, “debt free,” wouldn’t leave me alone. It seemed it was everywhere I looked around the internet. It popped up in conversations with people we talked to at church. Still skeptical, I picked up one of Dave Ramsey’s books, The Total Money Makeover, at the library to find out what the buzz was all about. Throughout the book, there were stories of families making extreme changes to their lifestyles and even getting second jobs or earning extra money from home, all for the goal of becoming debt free. Around this time, my husband and I both felt the call to get out of debt. We had over $22,000 left in student loans, and it was time to do something about it. In September 2013, we tentatively started our journey to be debt free. We planned to reduce our debt by making an extra payment of $39 each month. There seemed to be absolutely no wiggle room in our budget, so even that small amount felt like a huge step. The cool thing is, even paying a tiny bit extra towards loans can really accelerate your journey to debt free in more ways than one. After taking that first tiny step, God multiplied our efforts. Just 3 months later, we paid off the smallest of our student loans. Suddenly we were on track to have all of them paid off within 25 months. For the woman who thought she’d be paying off these loans for more than a decade, this in itself was amazing! Being a total math nerd, I had always been a critic of the “debt snowball” method of paying off debt. It doesn’t make sense to pay off a loan with a lower interest rate first! That would be the first of many times I was humbled in this whole experience. After paying off that first loan we were inspired to get even more extreme with our money saving measures to pay off our debt faster. Here are 9 crazy things we did to save money to put toward our loan pay off. When we were done, we had paid off $22,047 (and 93 cents to be exact) in debt on a household income that (at the time we started) fit under the government’s low-income category for a family of four. And we did it all in 9 months. Update: Since publishing this article the question I get all the time is, how to get out of debt fast on a low income. After all, it does seem sort of crazy to be able to pay off almost as much as you make in a year! To help get you started, I wrote a super practical post that shows exactly what steps I would take if we were to do it all over again, with tons of resource to help get you started. I wish I could recount for you all the miraculous ways that God provided for us despite our relatively small sacrifices during this time, but at the risk of making this too long, I will finish our story. After all that, and just 9 months after starting our journey to debt free, we made our very last student loan payment. Since God is a brilliant storyteller, he just couldn’t let the chance pass to make His point with a flourish. We were able to make that last payment and be debt free exactly one year to the date that we had to sell our old home in a short sale. We could do nothing but stand in wonder at how far He had brought us both spiritually and financially in just one year. Faster than I can even believe, we cut 5 years off our debt repayment, and along the way we have achieved a huge new sense of joy and freedom. Our story isn’t unique. There are thousands of families across the country taking control of their finances. Just like us, they are determined to get out of debt no matter what it takes. If you’re staring down what seems like a mountain of debt and a budget that already doesn’t add up, not believing that getting out of debt is even a remote possibility, I’ve been there. Despite all odds, we did it, and I really believe that you can do it too. I hope our story of paying off over $22,000 in debt in just 9 months has been an encouragement to you. I challenge you to take that first step to becoming debt free! Every small step gets you a little closer to financial freedom. Are you working on getting out of debt? Or just getting started? Share your story in the comments! My husband and I are just starting our journey with Dave Ramsey’s baby steps. We are on step 2 and have about 50,000 to pay off. We just sat down last week and figured out how we are going to be out of debt by December 2016! We are also a one income family and both of us are in school. We plan to save up and pay for school one semester at a time! That’s fantastic. We’ve just stared to move forward in having our debt paid off. Have your been successful so far? This great to hear. My wife and I are debating on paying off all our debt just curious how much did your credit score go up. Did it constanly go up over time or immediately? Sorry, Nathan! Sorry, but I honestly have no idea what my credit score was. That’s not something I usually track. After all, if you’re not in debt who cares what it is? That said when we get ready to buy a house, I’ll probably be paying closer attention. Best wishes on your debt pay off. I can say now almost four years later, it has been very worth the effort. I enjoy reading debt-payoff stories like these. I also started with the debt snowball method and paid off my student loans in 3 years. (No husband, no kids, still living at home). Now, I have a mortgage, a new car (big mistake) and a boyfriend. I’m trying to pay off my mortgage as fast as possible, but it’s so hard to determine where your money should go each month ie: emergency savings, debt, or retirement accounts. Thank you and keep blogging! Excellent pointers! Being debt free is so important to us as well and we hope to pass this to our children and all future generations. That is such a good point! I can just imagine how much simpler our children’s lives will be if we can really instill these values early! This is really encouraging. It’s time for is to really do this and not just talk about it. Wow! This is such an awesome story — how great that you reached your goals even sooner than anticipated! We use Dave Ramsey’s personal finance for kids curriculum in our homeschool — good stuff! Congrats to you! My husband is all about Dave Ramsey too and we live Debt free. We payed off $70k in about a year and a half. He worked ridiculous hours to get it done. Felt so good to pay that off! Congrats! I bet those long hours were so worth it. It really is an amazing feeling to be debt free! My husband works 3 jobs and I stay home with our kids. We are working hard to pay off $16,000 and then we want to tackle paying off our house. It’s HARD but totally worth it when you see one by one bills being paid OFF. Hey Brianna I just read your comment from a while ago and just wondering how the last few years went paying off debt. Have you guys made any progress? Not, being nosey…but how much do you allm ake annually to pay off so much in a short time? I’m just trying to see is this realistic? We have a budget but need improvement. We have one income which doesn’t even cover monthly bills at the moment so we are making cuts where we can and I’m trying to find something to do from home. I know we will get there one day. I know what you are going through, Jessica. Times have been incredibly difficult for us financially, too. Hang in there. Keep the faith. I’ll be praying for you and your family. I will pray for you as well since I was there until just recently. Congratulations, Shannon! Thank you so much for sharing your story to encourage others. I am literally writing a post right now (I saw your email come in and got distracted) about *crazy* ways to make the paycheck stretch as long as the month. My husband and I worked hard to get out of major credit card debt back before we had children. Now all we have is our mortgage, but we want that gone desperately. We have one, low income so that makes it difficult. Stories like yours give me new energy, however. I will be linking your site in my post for my readers. Thanks, again, Shannon! And CONGRATULATIONS! YOU did all of this, not god. What an awful thing to say. If you don’t believe in the power of God and what he can do…I can only imagine how depressing your life must be. I will be praying for you! I am praying for you, as well. I can’t imagine living life without the hope of Christ. I pray that you will come to know the One true living God. My question for you would be… what is going to happen to you when you die? I hope you will consider that this year. My heart hurts for you. Please know that I will be praying for you to come to know the truth of the God who created you, loves you, and desires to have a relationship with you. That personeneedsto understand that things are possible through god.I truly believe in the lord and glad to have him in my life. We just bought the Dave Ramsey starter kit and I can’t wait to get started on it! I just finished step one today. It took only 2 months as a single mother making 35,000 a year. I’d been trying to budget for years. It never clicked until I got on a cash budget. We love Dave Ramsey’s teachings! We’re going through the legacy journey right now! Kylie, what’s the legacy journey? I loved your post! It was so inspiring. My husband and I have been on our journey to financial freedom for 2 months now and we are hoping to be debt free by April 2015. Thanks for sharing your experiences! Wow! Amazing! My husband and I have started the Dave Ramsay program more than a couple of times. We always get a good start and then fall to old habits. We are now starting from scratch yet again, but I feel like this time we are both so motivated to get it done. Your story motivates me! Thank you. My husband and I love making up numbers and seeing how we will get out of debt. It’s so funny because he is only in school year 3 of at least 8. So, we are anticipating much debt to be accumulated YET. But his schooling will bring a very well-paying job, so we are excited about the testimony we could have when school and a house quickly get paid off… even other people in my husband’s future profession act like they have NO money! Trust me, we live on less than 15k, so the anticipated increase of AT LEAST 100x will definitely be enough – despite what the worldly people say! While I know that we (my family) will not be paying off all of our debt in 9 months. I have finally gotten my husband on the bandwagon. Anyway, after 4 months of unemployment there is finally the realization of debt and the toll it’s taking on the family. I am happy to say that today, we have paid off our first credit card! We still have 6 more to go, plus student loans, but you gotta start somewhere. Thanks for the encouragement! Congratulations! That is a huge accomplishment. That first taste of success is really what will keep you going! So happy for you!! We are constantly learning to make big sacrifices if we want to reap big rewards! Reading your story and surrounding ourselves with people that also think this way can be the fuel for the fire. We are moving in with my dad to get out of debt this coming year. Praying for strength and a gracious heart as we make this transition. We’re excited to pay off the rest of our student loans! God has blessed us and I hope we can bless Him in return for His love and generosity! Thank you for sharing and congratulations! Wow Liz! Praying your journey to debt free goes super fast and that God will honor your sacrifices as you follow His calling. I’m so excited for what he has in store for you! This is inspiring and totally possible for me… with one obstacle. My husband is totally not on tge same page at all and has no desire to be debt free. Hi Anna! We made a lot of little changes until we couldn’t find anywhere else to cut, and then got even more extreme from there! Here’s my post with 9 of the crazier things my family did to become debt free. https://growingslower.com/2014/10/how-to-be-debt-free.html. This really makes us consider more options (loans) and it opened our eyes towards a great repayment plan. I usually am scared on taking up loans cause I am not sure on how to handle it, but seeing your made me have that confidence. I hope you’ll read this with all the grace and kindness I intend, because I really believe being debt free is crucial for any of us to have a positive financial future. Even more than I am saying that anyone can pay off debt, I’m saying that you almost have to find a way. If you don’t, what’s the future look like? More debt? Constant financial stress? I would love to have you sign up for my free Family Budget Challenge that’s going on right now. I’m going step by step exactly how to create financial goals, a budget, and achieve your goals. But for now, I would say if you feel your income is too small, then the next step would be finding a way to earn more, right? Dave Ramsey’s book is full of stories about people getting second jobs delivering pizza or whatever to earn more to pay off debt faster. Another great Dave quote one of my readers pointed out to me yesterday was to sell so much of your stuff to get cash quick to “make the kids think they’re next”! For me, I believed in the debt snowball plan, but switching to cash envelopes drove me crazy. It really does help your budget though! Congratulations!! Congrats! That is a huge accomplishment! I know sometimes people start to feel discouraged when they read our story, feeling like they can’t do what we did. But there are so many other stories out there like ours where people are getting out of debt even on a small income. Thanks for sharing your story!! What book is everyone learning from and what is the snowball effect! I believe I can come out of this debt nightmare!! I am excited for you, but I didn’t really see any “how we did it” tips really. Just that you started paying off the debt and then nine months later you were done. I tried to click on the “9 crazy things…” link but got an error message. I would like to know more like what you actually did to have the extra money to pay when you said you could barely afford the extra $39 a month in the beginning. I see people say they can do this…but typically it’s only if you have something large you can sell, like your car or a house. Not for normal people. Hi Sarah! We have been having a huge influx of traffic to the blog, and we’ve seen a few server crashes in the last couple of days. We are up and running again, so I encourage you to head over and check out the 9 crazy things post. We didn’t sell anything of large value like that. A few little things that we didn’t need anymore. We also used most of the techniques in the 97 Easy Ways to Save Money post. Also increasing our earning through doing side jobs, which I list in my 60 Real Jobs for Stay at Home Moms. It’s hard to sum up all in one article, but I am more than happy to share more or answer any questions you might have. Thanks for stopping by! It’s because of our own journey learning to save money in hard times I started Frugal Living Mom to help people find things that they could get for free and put “frugal strategies” into their everyday lives. And I get even more inspired when I read stories such as this. Awesome! Just when I think I can’t do it, along comes stories like this one to keep me motivated! You can’t see it, but I have tears running down my face, because I felt like i was sinking, but this really encouraged me yet again! I love this story!!! Hi Shannon, I’m just starting my journey to being debt-free and blogging along the way. I get so motivated reading about your success in such a short period. Your blog is awesome and I can’t wait to read more from your site. Great read! Thank you! Congrats on your goal! You can do it! For sure, we had the benefit of living in an area with relatively low cost of living (North of Spokane, Wa at the time). However, we all face our unique challenge when trying to pay off debt, and in those situations, I’d encourage you to think outside the box. I’ve known families who move in with in-laws, or do any number of crazy things to get out of debt. Don’t rule anything out. Take each of your budget items and ask yourself what would we have to do to radically reduce this expense. And remember, it’s only temporary. 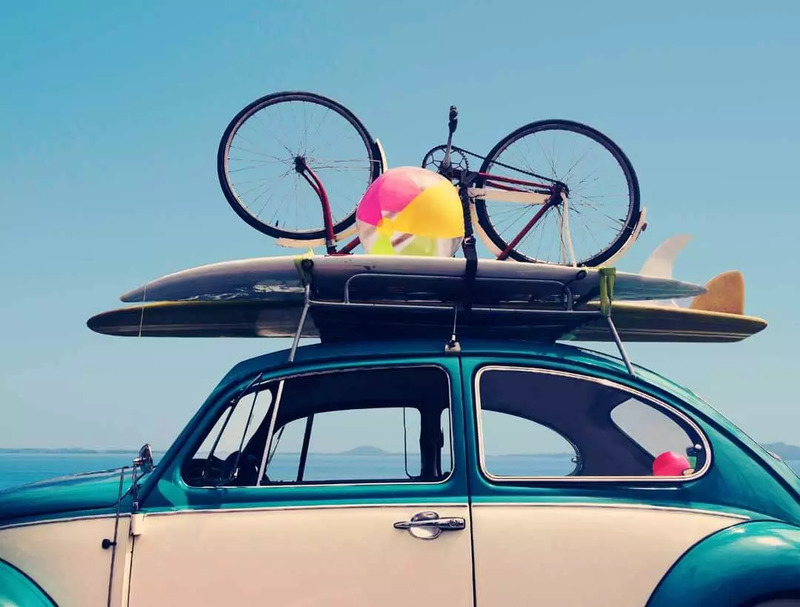 The faster you get out of debt, the sooner you can start living a financially free life and intentionally spend in the areas that are really important to your family. I am in my mid-twenties and single, do you have any tips for relieving debt on a $31,000 income? I have over $25,000 in debt. I am very interested in what you have to say! Please, and thank you! Thanks, excellent story. I will be purchasing that book. My husband and I paid off 16,000 in 8 months. It was hard, but it helped to get back to our farming roots and save money by growing our own food and reusing everything we possibly could! It’s tough but so worth it! This is a great story and I am glad you and your family are debt free, don’t get me wrong… but this doesn’t really explain at all how you repaid off that whopping $22k of debt off, besides crediting God and paying $39 extra the first round. Just some feed back. this just seems like a personal story to me. I thought the same thing! There really is no useful tips here, just her saying “I did it so you can to” but not HOW she did it. Also, if you paid off $22k in 9 months, then your “single low income” looks a LOT different than my single low income. Because $22k is about what we would MAKE in that amount of time. So obviously that would be impossible for us and for most people. Congratulations… I know I’m late to the commenting party but something like this is never not worth celebrating. My wife and I went through the Ramsey plan and the snowball is kinda addictive… I love killing off the little debts and building momentum for the bigger ones. We achieved non-mortgage debt freedom and it was great. We’ve slipped a bit but we’re working the plan again… it always works. Thanks for the timeless encouragement. Thanks for sharing such a great idea on how to pay off debit in short time. In fact lot of people are swimming in debt and don’t know how they are ever going to pay it off? You’re not alone. According to some statics, the average U.S. household has more than $15,000 in credit card debt. I am a disabled veteran that had to medically retire in 2012 after 28 years of service. I am in debt for $76500 and some high interest that I am paying. I have no mortgage note, own my home paid cash for it and paying one of my bills $935 a month which I owe 2 more years on it. My house got damaged in the storm 2 weeks ago and I have no insurance. I have not been late on any payments which I pay about $3175 in bills every month and it leaves me with $186 to last until next payment. I can’t get a consolidation loan because my debt to ratio is too high. Because my house is under renovation no one will give me an equity or loan against my house until the damages are fixed and I can move into it. Hey, I really enjoyed reading this blog post. I am already building my list to see where my money is going and adding up my debts to start the snow ball effect. I am only 22 years young already in debt. I was married and divorced already, homeless, pregnant(which ended in termination=() and sitting on debt. It has been so overwhelming for me but I am so determined to make my new year which is Nov 23 the year of financial freedom! I am tired of being consumed with debt, a horrible credit score and the stress it causes me. 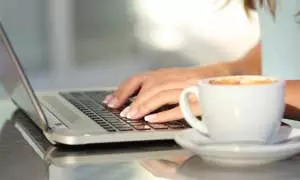 I also have a blog and want to start gaining income from it. I’ve been reading up on ways to gain traffic so that I can lead affiliates my way and ads to boost some monetary gains. Although I know this journey will be tough and Ill need to be extremely fugal, I am excited to share with the world that it is possible to be debt free, especially if I can do it! THANK you growingslower, you have come right on time for me to have crossed your path. Very insightful and really opened my eyes to the fact that I am capable of being debt FREE! I had to write a comment for the fact that I think God is so Good,he lead me to your this website. It’s almost 11pm and my husband and I just wrapped up our budget meeting ( month 3 of EveryDollar Dave Ramsey) and I wasn’t content with the grocery dollar amount:$800 family of 5. I knew as a mother I could get that line item down. So I Googled “Family of 5 Grocery budget” and here I am. As I was reading your post and before you mentioned Mr.Ramsey I said to myself she sounds like Dave..just had scroll down more to confirm my suspicion. So happy to have found you. Keep fighting the good fight and spreading hope. HI…so glad to know that becoming debt free is really possible. I always maintained a budget & was debt free except for our mortgage. Then we close our eyes and did things that were plan dumb. Allowed our children in incurred hefty student loans, took out an equity loan and paid the minimum due for years. And then to our surprise, my husband lost his job. We owe so much and really don’t know which way to turn. I took the Dave Ramsey course years ago but it was hard to get the family members to take it seriously. Now I am paying high interest rates on credit cards and can only pay the minimum balance. Charging on credit cards prescription medicines because of no insurance. I have lost hope. God I need a miracle. I am so sorry you are going through this! Debt really is an ugly and painful thing. I pray that you will be able to get back on track quickly and easily. To be certain we worked hard to be debt free, but God truly did work a miracle and put things in place so that we could get out of debt so much faster. I hope the same will be true for you! Hi Shannon, what a great story! Congratulations on getting out of debt in such a short amount of time. The Snowball method definitely works, even if it doesn’t exactly make sense mathematically. 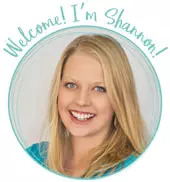 Congratulations on being debt free, Shannon. You inspired and motivated me to work harder to pay off my debt. Little by little, I was to able to reduce my debt and thanks to you.